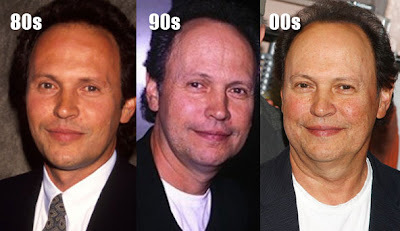 Here we have the sensational Hollywood actor, Billy Crystal, a marvelous comedian who starred in movies such as City Slickers and When Harry Met Sally. 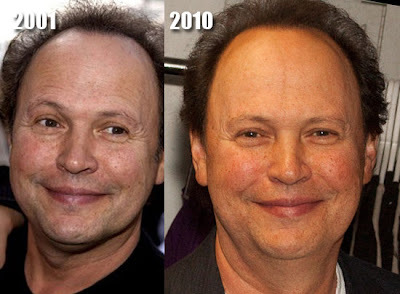 Billy Crystal has been out of the public eye for the better part of a decade, lending his voice to animated projects such as Monsters, Inc. and Cars, however recently there has been some murmuring about his appearance, and the possibility ol' Billy underwent some plastic surgery. But how true are these rumors? The allegations suggest Mr. Crystal has undergone a minor facelift, an eye lift and facial fillers, however we strongly believe the culprit in his ever changing appearance is directly attributed to weight gain, which has altered the definition and shape of his face. The eyelids look a bit heavy and his cheeks are more pudgy due to a few extra pounds.